SECTION 16 CAN BE USED FOR ANY NVIDIA CARD SYSTEM WHEN CHANGING DRIVERS OR UPGRADING THE VIDEO CARD. 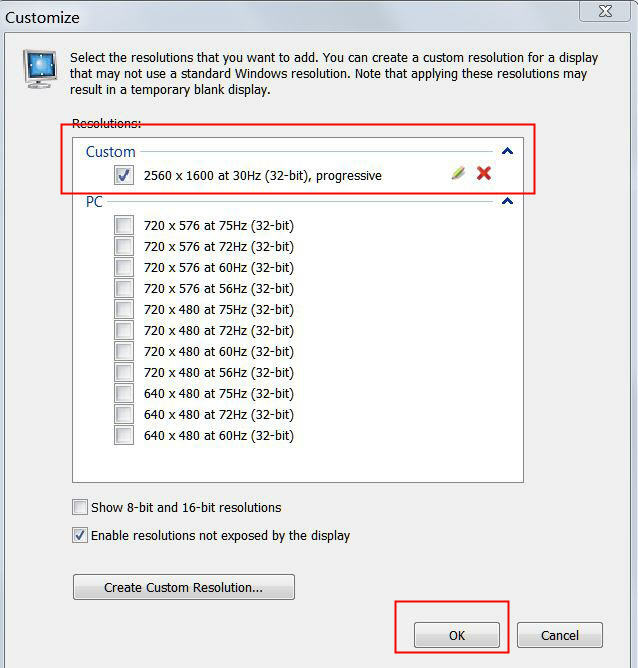 The use of matching Vsync with frame-lock through Nvidia Inspector (1/2 refresh rate) on a 60Hz monitor will not work in "window mode", only full screen mode. Prepar3D above version 2 is a window mode application. It utilizes a borderless window that appears to be full screen, but isn't. Because of that and the WDM (Windows Desktop Manager) to accomplish the same result the monitor must be able to run 30Hz directly which will switch the WDM to run 30Hz when booted with Windows. The same approach (30Hz) can be used with FSX(SE). I cover all this below. Drivers and hardware have changed in the last several years. This post supersedes the original thread: http://www.simforums.com/Forums/drivers-nv-inspector-fsx-cfg-complete-guide_topic36586.html and takes into account the changes that have been implemented in OS updates and driver technology. I wrote this in a simplistic flow-chart style outline to cover all the various monitor abilities. It may appear complicated but it isn't and is easy to follow along. Just take each section one at a time and follow the directions. The outline will tell you where to go and what to do each step of the way. This may or may not work for you diehard FS9 users. I do not have FS9 installed and can not test it. BEFORE YOU START - It is important to understand that what is presented here I have found to be a successful starting point. That does not mean it is set in stone. Your hardware, your system ability, your addons as well as your personal demand define what may work best for you. As such this outline should be followed carefully without straying and afterward, if you find that you can achieve a better result adding to it or using other methods, by all means.. do that. I posted this in the forum here https://www.simforums.com/forums/bigger-visuals-needed-advice-required_topic60264_post383496.html#383496 which explains in detail what I stated above. WINDOWS 7 ONLY: It is important to run a "BASIC AERO" desktop theme when applying these changes in order to interact with the Windows Desktop Manager in Windows 7. Windows 8 and Windows 10 do not require any special desktop themes. STRONG ADVICE: If you are currently using FSX Box (the original release Microsoft Flight Simulator X product with or without Acceleration) I would advise that if you do not wish to move into Prepar3D that you should seriously consider uninstalling FSX Box and purchase; Flight Simulator X - Steam Edition to replace it. Flight Simulator X - Steam Edition is equivalent to FSX Box with Acceleration, and, it comes with a large list of fixes that FSX Box will never have. It also runs far smoother and allows more overhead than FSX Box. You will have a far easier time setting up FSX-SE and will find it all around better than FSX Box. The price for FSX-SE is very reasonable given the original cost of FSX Box w/Acceleration. VERY IMPORTANT: Should you decide to move to FSX-SE be aware that FSX Box uninstaller has a serious flaw and leaves the FSX Box registry behind when it is uninstalled. This can cause issues with addons as FSX-SE will assume FSX Box is installed. 1. Uninstall FSX Box (Acceleration) from Windows completely. 2. Go to START - in the box type "REGEDIT" when Regedit appears above right click and select "RUN AS ADMINISTRATOR"
-IF you have other MS Games installed, double click MICROSOFT GAMES and only delete the folders listed as Flight Simulator or Flight Simulator X. Close Regedit and reboot the computer. You are now clean and ready to upgrade to Flight Simulator - Steam Edition without any issues or addon problems. In case you have not heard, this advice has been around since 2006 - Do not install a sim into Program Files or Program Files (x86). If your C drive has enough disk space, create a folder on the root of C:\, or, create a folder on the root of another hard drive, preferably a SSD, and use the CUSTOM INSTALL option to install your simulator to that directory. You will save yourself a lot of headaches over time that way Your addons, assuming they are professionally made and packaged, will know where the sim automatically. Thanks go out to 'Ronski' for providing the original file location! 2. Unzip - IMPORTANT: Make sure all the files are in the folder it is unzipped to. 3. Open the unzipped folder, Right click: nvidiaProfileInspector.exe and 'Run as Administrator"
d. At the bottom, check the box: Run This Program As Administrator and click APPLY, then OK... click OK again to close the properties box. From there you do not have to ever right click and run as administrator from this point forward. The same tip can be used for any program. If you are using Windows 7 and have completely disabled UAC/Rebooted, you are not affected by this. If you use UAC with Windows 7 then you must do as outlined below for W8 and W10. If you are using Windows 8 or especially Windows 10 and even if you have shut down UAC/Rebooted, you MUST STILL RUN ALL INSTALLERS, INTERFACES, APPLICATIONS by RIGHT CLICKING, SELECT RUN AS ADMINISTRATOR. FAILURE TO SO IN W8 AND W10 CAN CAUSE YOU MORE FRUSTRATIONS AND TIME LOST THAN IT IS WORTH. IF you use the tip above I outlined for shortcuts to EXE's or the EXE's themselves you can eliminate right click 'Run as Admin' for that application. It does not mean you must wipe out your sim and start over. It means that the FSX(SE) and Prepar3D configuration (.cfg) files can become corrupt for many reasons. It is not something that happens all the time however history has shown many issues can be corrected/fixed by simply backing up the original CFG file and letting the sim rebuild a new one and observe the result. Of course its a PITA because you must also redo all your graphics/scenery/environment settings as well as, for some folks, click YES to a long list of addon permissions the fist time the sim is run to rebuild a new config file. I do want to impress the importance of this action as it has a solid basis in proven fact to fix problems and can save you hours of tweaking/diagnosing for nothing. It may make no difference but starting with a clean config file is a fast way to eliminate hours of frustration and if building a new one does not correct issues, you can simply restore your original. You may SKIP this section if you like but if you have a config file full of tweaks or you are here because you are looking to try a fresh routine, I would not skip this. To start this process, you may need to set Windows to 'SHOW HIDDEN FILES AND FOLDERS' in CONTROL PANEL>'FOLDER OPTIONS' VIEW TAB first. Please make a copy of your current FSX.cfg, FSX_SE.cfg or Prepar3D.cfg file and store it in a safe location, then delete the one in use. can be in a folder named FSX, or FSX-SE copy FSX or FSX_SE.cfg to a safe location, delete the original. Remember, if after all is said a done if you do not find any difference in the sim then the original file is now confirmed as OK. I would continue to use the new generated file anyway. Launch FSX or FSXSE as administrator. FILTERING dropdown is set to: TRILLINEAR and the box for Antialiasing is UNCHECKED as shown below. NOTE: DX10 PREVIEW CAN NOT BE SET USING THIS OUTLINE. FOR DX10 REFER TO WEB PRODUCTS THAT ENHANCE DX10. I am not outlining sim setup here, only the proper settings in order for NVI to work correctly in all Windows versions with newer drivers. Once this change is made in the FSX/SE settings, close the sim and got to SECTION 5. Prepar3D has IN-GAME AA settings options not seen in FSX(SE). We can ENHANCE these settings with Prepar3D. Settings must be made in-game directly under the GRAPHICS section as shown below first. P3D v3 has less options for AA than P3D v4. Start with 4 SAMPLES in P3Dv3 and 4xMSAA in P3Dv4. NOTE: I know some will say 'wait? isn't that too low?" yes, it is, however later in this document we will use NVI to enhance this setting which will afford us the best of both worlds between performance and shimmer control. Set Vsync to (ON), Triple Buffer checked, Target Frame Rate as shown (30) as well as enable WIDE-VIEW ASPECT RATIO. Most monitors today are not running standard aspect ratio (4-3) so enable wide view aspect for the wide screen monitor. Many most likely know that the name for Flight Simulator X has changed over the last year. Take note of the SPECIAL TIP I outlined below. Use it every time NVI is opened. NOTE: FSX and FSX-SE is the same profile. There is no separate profile for each version. When the Microsoft Flight Simulator 10 profile is loaded in NVI and FSX.exe is confirmed listed as shown above, go to the next section. With the recent changes to driver code and with Windows10 updates, the desktop manager and driver interaction has changed. In order to address changes correctly we need to set the AA compatibility mode to DIABLO III for Windows10, setting this in Windows7 will not change anything however it won't hurt anything either so I am outlining it be changed to DIABLO III for all setups. Once set as shown above, click APPLY CHANGES in NVI and go to the next section. The great thing about FSX and FSXSE is they are TRUE full screen applications. Because of that there are options to work with. Prepar3D v2-v4+ is a faux full screen application, meaning, it looks 'full screen' but its actually running 'window mode'. Because of that and how it is coded, running 60Hz monitor @ 1/2 refresh rate in NVI will not work with P3D however in FSX(SE) it will. Some monitors will allow a variety of refresh rates, others are locked and can not be changed or forced. WITH FSX(SE) It is not 'critical' to run 30Hz as 60Hz will work as long as you run the sim in "full screen mode". If your monitor will run 30Hz it is a bit better choice because it simplifies the setup. If this is for Prepar3D v2-v4+ a 30Hz monitor refresh rate is very important. You may wish to review the documentation for your monitor first. it may outline how to switch to 30Hz or if a cable port change is needed, such as going from a DVI-X to a HDMi input. Further, just because the monitor documentation does not mention 30Hz does not necessarily mean it won't run that refresh rate. There is a way to test for it. If your monitor is already set to 30Hz, has the ability to run 30Hz and you know how to change the native refresh rate yourself without a guide, do so and continue below. If you change the monitor refresh rate in Windows you MUST reboot the system after making that change before continuing or the refresh rate is NOT applied. Verify the refresh rate you are running before continuing. For Prepar3D v2-v4 do not change any NVI setting for Vsync, it will not make any difference if you do, leave it alone. The only option for changing Vsync in Prepar3D is in the P3D graphic settings directly. NOTE: The first example is the same as running a monitor at 60Hz @ 1/2 Refresh Rate in NVI however since the monitor is already set to 30Hz, setting 1/2 Refresh rate is NOT NEEDED and will force stutters if set that way. Alternately: There are people who run very light sims for scenery and can run 60FPS in most circumstance, in that case leave the monitor in 60Hz mode, set Vsync to FORCE ON and run 60FPS locked in the sim. If your system can not maintain 60FPS or somewhat close at all times, running the sim like this may not work well. Your monitor is either designed to run 30Hz natively or run 60Hz native and offer the 30Hz setting. It is possible a monitor may not offer 30Hz as a option but can be forced in a custom refresh rate setup. Your monitor may not run 30Hz at all and you are stuck at 60Hz. That does not mean its all bad, with FSX(SE) 60Hz running 1/2 refresh rate will work fine. However if you are running Prepar3D v2-v4+, then it would be best to obtain a monitor that will allow 30Hz operation. On the opposite side you will see a list of monitor resolutions. The top of the list should be your monitors (NATIVE) resolution. Click on that once to highlight it. In the box next to the highlighted resolution is the REFRESH RATE for the native resolution. d. If you DO see 30Hz listed, select it from the dropdown and then click APPLY at the bottom of the box. Your monitor will go blank. One of two things will happen. There are monitors that are native 60Hz and do not offer a 30Hz option. That does not mean the monitor wont run 30Hz but it probably does mean it wont. There are many newer 60Hz monitors that do not offer 30Hz options natively but will still run 30 just fine by forcing the setting. On the opposite side you will see a list of monitor resolutions. The top of the list should be your monitors (NATIVE) resolution. Click on that once to highlight it. 3. With the native resolution highlighted, click button below the box named: CUSTOMIZE a new box will appear. NOTE: The first time this is run you will see a huge scary warning box pop up, ignore it, agree to the terms and move on. 6. Click TEST at the bottom of the box. IF your monitor can run 30Hz you will be asked if you wish to keep these settings - select YES. 7. Click OK to close the CUSTOMIZE box. 8. In the Nvidia Control Panel- Change Resolution box, you will now see a listing at the top of the resolution box under "Customize" click once to highlight that. The REFRESH RATE box on the side should now read: 30Hz. If it doesn't, click on it and select 30 from the list. Click APPLY and then when the box appears, click YES to keep the setting. 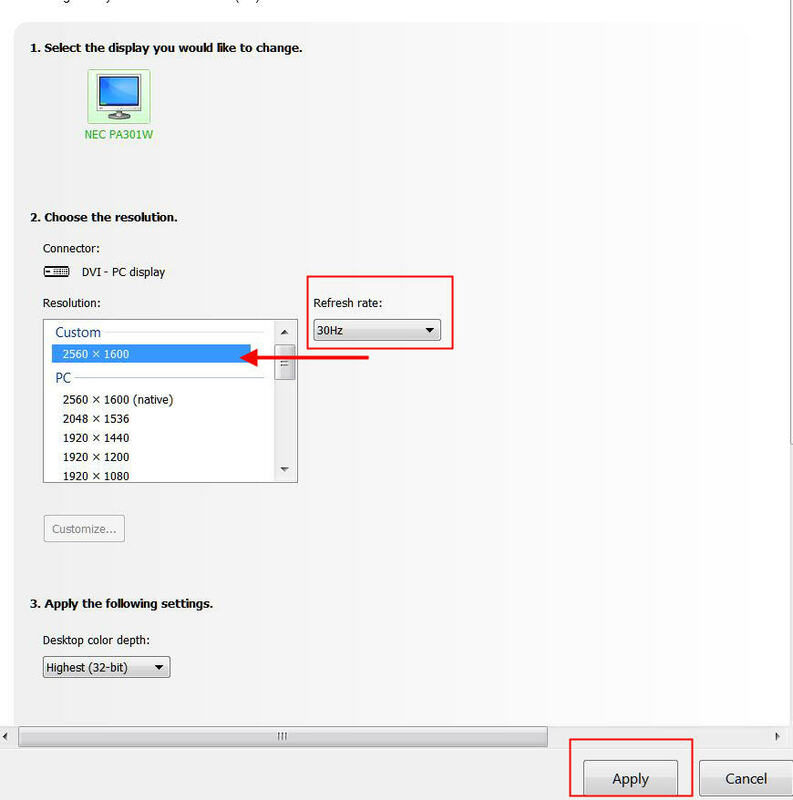 IMPORTANT NOTE: If you happen to SWITCH between the new 30Hz profile back to 60Hz profile and visa-versa, be SURE to verify the dropdown under #3 in the image above: Apply the following settings - is set to HIGHEST (32bit) before clicking APPLY. Remember, switching refresh rate requires a system reboot before it will take effect. IMPORTANT NOTE: ANY SETTING CHANGES TO NVI REQUIRE THE SIM BE CLOSED AND REOPENED. You can not make 'ON-THE-FLY' setting changes with NVI. When we begin to apply higher antialiasing (jagged edge and shimmer control) to the sim, the performance will naturally drop. The higher the AA level and the higher the resolution, the more demand on the system to render a scene. This is compounded by heavy weather (any sim), payware airports and aircraft (any sim) and those that incorporate new features such as dynamic lighting (P3Dv4). You may read about folks running 4K resolutions on monitors and TV's with Flightsim. Just be aware that in order to run resolutions that high with high end addons requires a very powerful system (expense) and even then their experience is never perfect. With the mentioned elements, that 4K can become a liability. There are trade offs with resolution. Typically the higher the resolution the less need for higher AA levels and in some cases Vsync since image tearing is not as noticeable. The image is sharper but at the same time your system has to draw those frames and if higher resolutions are in use with settings that demand video memory, you can be looking at consuming 11GB of video memory, fast. The more pixels you push and the higher the scenery settings, the more it will cost to run smooth. There is no such thing as a free lunch. I suggest keeping the resolution reasonable. When shopping a TV or monitor for Flightsim use be sure to research very carefully the inputs and the resolutions/refresh rates available. Its important and good to have refresh rate options, but it is also just as important for those options to allow you the ability to run lower but decent resolutions should you find them a better option. Resolution is one factor, the level of image processing to clean 'the jaggies" or to reduce or remove shimmer and annoying moving morie patterns that can appear in autogen or city buildings is another. As mentioned the higher the resolution the harder the GPU will run with higher AA to clean those items up. These annoying visuals have been part of Flightsim since day one and you will most likely deal with them. Even without fancy new features such as cloud/ground shadows and dynamic lighting, heavy weather and clouds in any sim version will still place a high demand on the system running high AA settings. With that being said I will outline the basics to start this process and show where it can be adjusted. FSX(SE) has no options to raise or lower AA in-game. This will allow that change. There are 3 settings I suggest for this, from the lowest to the highest without going overboard and completely crushing performance. You will need to test each one of these to see which is best suited for your system. Shimmer can look very bad on one monitor, and not as bad on another with the same settings. OPTION 2. 8xSQ [Combined: 2x2 SS + 2x MS] - higher quality, reduces many other shimmers. Just about any decent modern video card can handle this. I suggest starting with this setting unless you have a older or less powerful video card. START with OPTION 2 8xSQ [Combined: 2x2 SS + 2x MS] with Antialiasing- Transparency Supersampling set to OFF/MULTISAMPLING, complete this setup with configuration file edits from section 12 (FSX SE), 13 (FSX BOX) below. Test in-sim and if you need more shimmer control, add in Option 3 below and test again. Retest in the sim and check for changes. If your system simply cant deal with 2x Sparse Grid Supersampling leave Antialiasing- Transparency Supersampling set to: Off/Multisampling and use one of the first 2 options for Antialiasing- Setting posted above. GO HIGHER? yes, using Antialiasing- Transparency Supersampling you can move the dropdown into 4x and 8x Sparse Grid Supersampling but quite honestly the performance loss vs the image change may not be worth it to you. You will have to make that choice. Some people prefer higher AA and will reduce sim scenery or effects settings to obtain it. As shown in SECTION 4, Prepar3D v4 incorporates far more AA control in the game settings that the other versions of the sim. We started with a base setting in P3Dv4 of 4xMSAA and '4 Samples' in P3Dv3, now we will enhance those. At this point you should have the best of both worlds for performance and shimmer control. Going higher is possible however every step higher than this is going to cost in performance. With Prepar3Dv4, going higher is a simple matter of using the in-game settings of 8xSSAA. With Prepar3Dv3 in order to go higher you must increase the in-game setting to 8 Samples, and then increase the NVI setting to 8x Sparse Grid SuperSample. The settings I outlined are a excellent tradeoff between performance and shimmer control. Your video card ability will define how well these settings work. Set P3Dv3 AA to 8 Samples and P3Dv4 AA to 8xMSAA and deal with the simmer that may appear. There are options here so work with them and find out what works best for you and your hardware. NOTE: This must be edited into the config file. It does not exist otherwise. This tweak is system dependent! If you are pushing too much scenery this can BLUR the textures so you must experiment with this and scenery settings. if you see any blurry ground textures, experiment in raising the value. WARNING: If you enter the FSXSE settings for any reason, that value will revert to =4.5000000 and must be re-edited manually into the config file. TEXTURE_BANDWIDTH_MULT=160 This should be the FSXSE default today however it also depends on your graphics card what FSXSE will set this to. These must be edited into the config file. They do not exist otherwise. DisablePreload=1 - Stops the sim from loading the default flight into memory. This can be a memory hog and cause the sim to load slow. If you use the same 'DEFAULT' flight every time, this can remain out of the config however if you boot for flying in different locations, best to use this so the sim does not spend time loading a flight you may not use. Save and close the FSX Steam configuration file. Spikes and flashes can be seen. It is the way FSX(SE) is designed. IF you continue to see flashes and scenery spikes constantly that do not stop then there is something that needs to be trimmed in setting or slider.. it means the scenery load is too high for the hardware. BEFORE YOU FLY... Please close NVI out completely, then reopen it and VERIFY SECTION 6. Antialiasing Compatibility - DIABLO III, Antialiasing- Behavior Flags NONE - and Antialiasing MODE (your setting) has not changed. NVI is well know for not accepting those settings the first time they are made and saved. If they do not match SECTION 6, re-edit the profile and click APPLY again, close, reopen and verify. Make your sim settings for everything else... ready to fly. A NOTE ABOUT FRAME LOCK: I would highly suggest starting at 30 with Vsync enabled and after you have completed setup and tested you can also try running locked 60 or UNLIMITED with Vsync. Start with 30 and work through it as you test. FSX Steam does not need this edit however FSX Box does. Save and close the FSX box configuration file. Spikes and flashes can be seen. It is the way FSX is designed. That's it.. done. All other settings such as the screen messages can be removed using the P3Dv3-v4 settings menu. When setting up your simulator, I would AVOID items such as HDR, Dynamic Lighting, Shadows, Reflections and focus on this outline and the BASIC weather/scenery/autogen settings, first. From there add in the effects perks but be very aware that as you add very hard hitting aircraft, airports and scenery, your settings may need to be dramatically adjusted for those. I have seen a lot written and stated around AFFINITY MASK=, over the years. I understand the use and reasons why it may be needed but I can't base using the configuration edit without fully observing many flights in different circumstances that no graph or FPS tool is going to show. For me, this setting has never provided any positive change and I have tested thoroughly over the years. 2. The user is running external applications such as weather, gauges, taxi whatever, etcetera and it is pounding CORE0 or a physical core the sim is relying heavy on. I have had folks ask why would I buy a HT CPU when I am not going to use it.. There are several reason that I have outlined in the past. I am going to skip that here other than to say, the processor manufacture uses a test routine called "Speed Binning". This defines which chips go to the higher end product line, and which ones will be classified lower quality for the lower number CPU. HT slugs speed-bin better than non HT. In that I am getting a higher quality CPU even if I disable HT. I prefer to shut down HT in the BIOS, take the 200-300MHz higher stable clock speed over running the CPU hotter and lower speed with Flightsim (ALL VERSIONS) I would also either use external software to assign the last cores of a processor to my external application, or manually set that affinity in the Windows task manager. I have never found a use for Affinity Mask= (I don't run hyperthread). I have never found it to have any value at all with my sims or the sims I set up for others. This is how I approach the sim and affinity mask, its just not used. There are locations on the net that offer suggestions and calculators for AF=. I would suggest leaving Affinity Mask out of the configuration file for now and later of you think it needs to be looked into, work it out then. I do run a processor that has HT ability. I shut HT down in the BIOS when using my system for FSX/SE/P3D and will enable it for advanced engineering or video editing/production software. That's how I roll, never failed me yet in 11 years. Remember whenever video drivers are updated to flush the SHADER directory for the sim(s) at the paths shown below. After flushing shaders the first time the sim is run it will NOT perform well. You will need to fly a reasonable amount of time (20 minutes or so) to rebuild the shaders then reboot. This outline has changed slightly over the years. Obtain the driver from the Nvidia Driver support website. NOTE: DO NOT USE the Windows Device Manager to uninstall any Nvidia driver.. Both Nvidia and Microsoft have confirmed that will NOT WORK and leave a system improperly updated. SPECIAL NOTE FOR MSI AFTERBURNER USERS: When ever you upgrade a driver, always uninstall MSI Afterburner FIRST before you uninstall the original video driver. DURING the MSI Afterburner uninstall the application will ASK if you wish to keep your settings, select YES. Once the new video driver is installed, then reinstall MSI Afterburner (or an updated version if one is available). Your settings will take over and there is nothing to change or edit. Check the C:\ drive for a directory named C:\Nvidia which is a decompressed driver installer, if it is there, DELETE IT before uninstalling the driver from Windows. Go to Programs and Features. Select the: "NVIDIA Graphics Driver <version>" and uninstall it from Windows. Leave the rest of the items in the list alone... Then reboot the computer. NOTE: IF YOU ARE CHANGING THE VIDEO CARD, SHUT DOWN INSTEAD OF REBOOT. UNPLUG THE TOWER FROM POWER. EXCHANGE THE VIDEO CARD VERIFYING IT IS PROPERLY SEATED. MAKE SURE THE POWER PLUGS FROM THE PSU ARE CORRECT FOR THE CARD. MOVING FROM A OLDER VIDEO CARD TO A NEWER MODEL MAY REQUIRE PCIE POWER OPTIONS YOUR CURRENT PSU DOES NOT PROVIDE, OR, MAY REQUIRE ADAPTERS. ONCE THE NEW CARD IS INSTALLED AND CORRECTLY POWERED, PLUG THE SYSTEM BACK INTO AC POWER, AND RESTART. MAKE SURE THE DRIVER YOU ARE USING SUPPORTS THE NEWER VIDEO CARD. NOTE: NEW NVIDIA DRIVERS RECENTLY STARTED OFFERING THE USER THE CHOICE TO INSTALL WITH GEFORCE EXPERIENCE AND WITHOUT (JUST THE DRIVER). ALWAYS SELECT WITHOUT. DON'T INSTALL THE GEFORCE JUNK FOR A FLIGHT SIM SYSTEM. *Nvidia GeForce Experience - UNCHECK. - THIS MAY NOT SHOW IF YOU SELECTED TO NOT INSTALL THE DRIVER WITH GF EXPERIENCE. Click NEXT. The driver may do one of two things.. fully install the selections, OR, it may request a reboot before running the driver installer. Follow the directions. In either case, once the driver has installed then reboot regardless of if a Windows reboot is requested or not. d. Last, you can delete the directory C:\NVIDIA as it is no longer needed. BE VERY AWARE: That after any video driver upgrade or installation that the software Nvidia Profile Inspector must be restored with the proper settings as outlined above, and then verified before launching FSX/SE/P3D with the new drivers installed. 1. Run MSCONFIG (Windows 7) or the TASK MANAGER (Windows 10) and see if under the STARTUP TAB there is ANY entry for Nvidia... if there is, DISABLE IT. 2. Start the SERVICES list in Windows. Scroll to: Nvidia Telemetry Container. Right click and select PROPERTIES. Close everything, Reboot the system. Make sure NVI has been set back up correctly after the driver update. All the settings you made in the past are now wiped out in Nvidia Inspector and must be re-established as outlined above. There are other software solutions out there to perform the same service as outlined below. If your Nvidia video card will not work with MSI Afterburner (it should) use the software designed for it and simply duplicate the outline below with the other solution. 1. Download MSI Afterburner http://download.msi.com/uti_exe//vga/MSIAfterburnerSetup.zip unzip and run the installer "As Administrator"
When complete select to run MSI Afterburner. If this is the first time installing and setting up MSI AB, continue below. If you uninstalled saving the original settings profile in the process, reinstalling MSI Afterburner will be restored to your original setup. You can skip the rest of this below.... Your settings are restored with the reinstall or upgrade of MSI AB. DONE! 2. In the Afterburner GUI, click the SETTINGS button at the bottom. NOTE: Updates for this product are rarely needed. If you wish to check for a update use the manual button under the GENERAL tab. An update for this product is only needed if you have issues with fan control for a specific model of card. We are not using this product to overclock the video card, only control the fan speed far better than the card will, and, display the GUI temp in the Windows tray, that is all. 4. 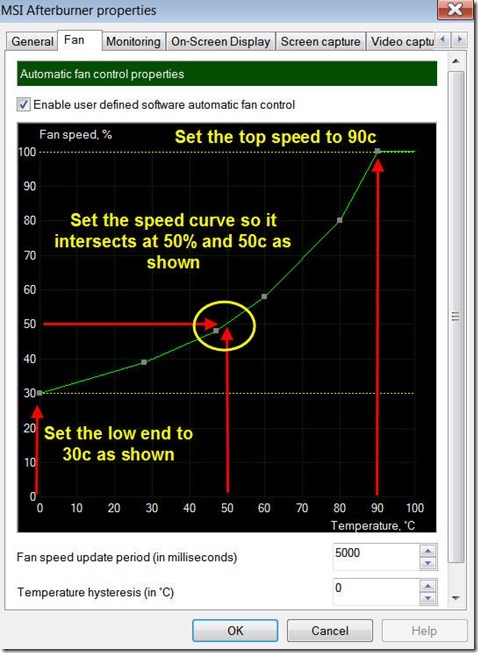 On the FAN tab place a check in: Enable User Defined Software Automatic Fan Control a curved line graph will appear. Then Under Active Hardware Monitoring Graphs, Select the Fan Speed by clicking on it once then go down to "Show in tray icon" and uncheck it. Repeat this for the Core Clock and the Memory Clock. Leave the GPU Temp enabled with "Show in tray icon"
Note: Those may already be deselected.. make sure the only item that displays "Show in tray icon" at the bottom is GPU Temperature. With GPU Temperature selected, next to "Show In Tray Icon" place the mouse pointer over the little color square box at the other end of that setting and click it once.. a color change box will appear, change the color to a lime green which is easy to read in the tray and click OK. NOTE: You can make this what ever color you prefer. 6. On the INTERFACE TAB make sure in the User interface skinning properties dropdown to select "DEFAULT MSI AFTERBURNER v3 Skin" You can choose the larger (BIG EDITION) or standard size depending on how high resolution your monitor runs. Special Note: Right click the Task Bar, select Properties and then on the TASKBAR TAB click the button under 'Notification Area" that says: CUSTOMIZE. Locate the MSI Afterburner TEMP READOUT in the list and set it to: "Show Icon and Notifications". This will display your GPU temp in the tray at all times. You can of course opt to not display it there. 8. NOTE: Older cards or Windows 10 users may not have access to the setting below. If your card is older or does not allow access to this feature, skip to the next step. Newer Nvidia cards may have a LOW throttling limit set internally. Bypass this by using the image below and set the internal throttle for the card to 90c. By default the card may begin to throttle at 75c and can cause stutters. This process bypasses that and DO NOTE these cards are OK up to the 100c range so 90c is a reasonable throttle-back limit. Be sure to click "Apply Overclock Settings at System Startup" and then click APPLY when the above changes are made. 9. Click the MINIMIZE icon in the top corner. NOTE: Clicking the 'X' box will CLOSE the application permanently until it is launched again. Simply minimize it and it will go to the tray and disappear automatically leaving the GPU temp readout on the tray at all times. SPECIAL NOTE: When ever you upgrade a driver, always uninstall MSI Afterburner FIRST before uninstall the original video driver. DURING the MSI Afterburner uninstall the application will ASK if you wish to keep your settings, select YES.